Usually one goes to LEA (Linden Endowment for the Arts) sims to see the creations of Second Life’s best known (and sometimes newly discovered) artists. Many will offer a high level of interactivity in their creations – some will offer sound as part of this. Of Sound Mind – there’s a wealth of sounds here! Now there comes an installation – more properly a series of installations – that references primarily sounds. 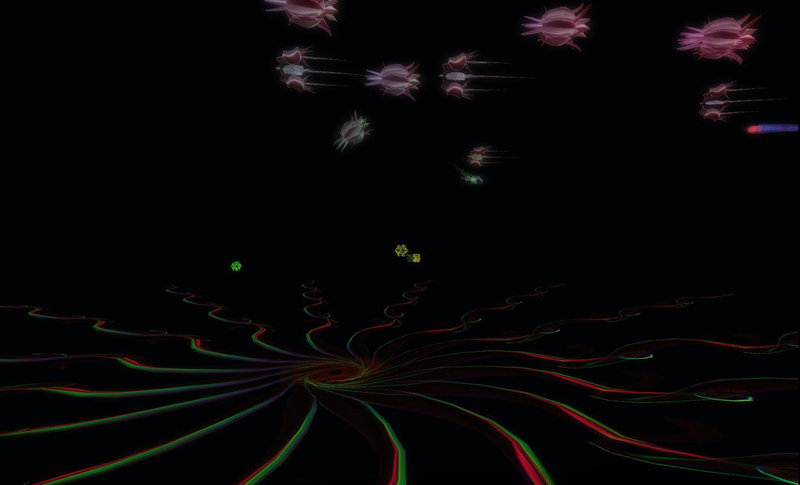 It’s called Of Sound Mind, and it’s the creation of Lorin Tone and friends (said friends including Glyph Graves, Madcow Cosmos, Inventor Alchemi, Mia Anais, Meriadne Merlin, P4ndor4 Quintessa, Marcus Parrott, Judi Newall, Chantal Harvey and Cube Republic). There’s a wealth of different environments and sounds to explore – instruments to interact with … and, actually, some stunning things to see, ranging from a spooky cave to a giant musical castle in the air, from a Hindu te,ple with a wealth of musical instruments to an amazing total windsculpture by Glyph Graves. And the whole environment has notecards and signs that explain what is going on – and who the people are who have created this. It makes for a fascinating an informative visit. 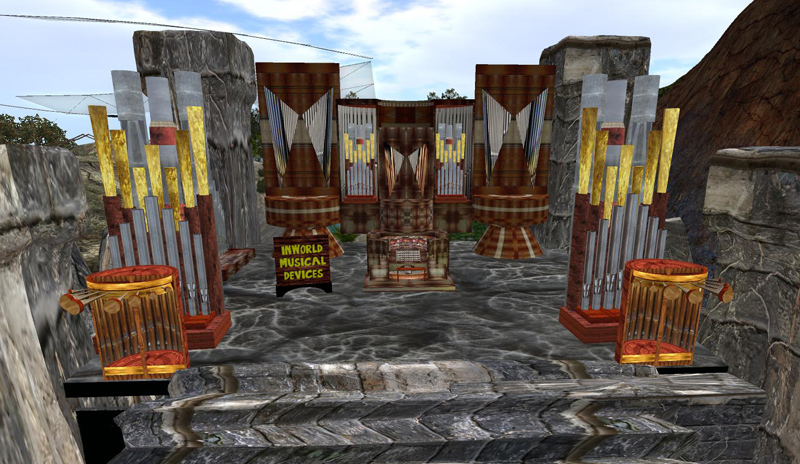 The installation kicks off with a performance by the Second Life performance group DRUM on Saturday, 17 November at 2 PM SLT for the Sim opening party. A very exhausted Lorin Tone will be happy to show you around the builds and answer questions after the show. Free beer and waffles. 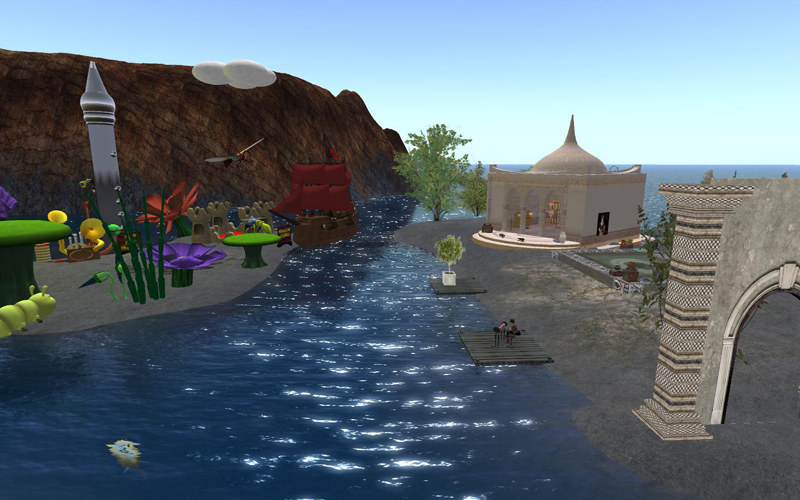 On Monday, 19 November at Noon SLT: Discussion on environmental sound effects in SL, hosted by the likely still exhausted Lorin Tone. 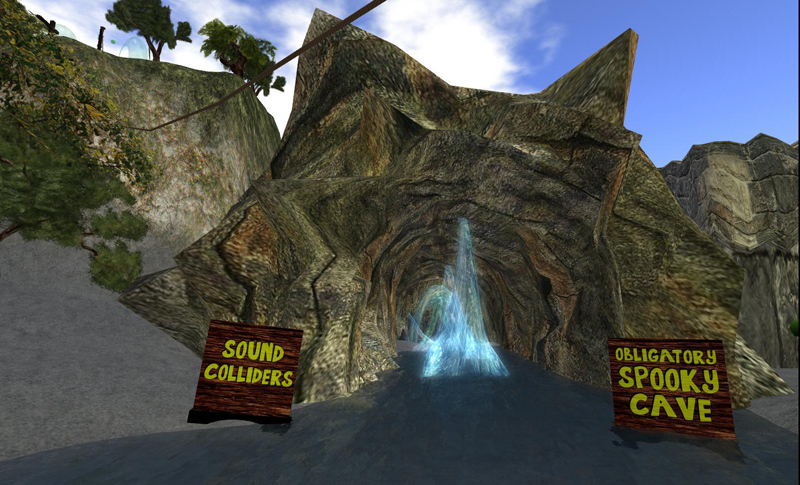 If you want to learn more about sound and music in Second Life, this is for you … or if you just want to explore a stunning land/soundscape. Previous Post: Celebrate Burn 2 with Designing Worlds!